Monday morning Beth took June to the pediatrician because eight days after returning from the camping trip she still could not speak above a whisper and now she had a barking cough as well. They diagnosed croup, which surprised us both because we thought kids her age couldn’t get it, but apparently they can and the pediatrician said they are seeing a spike in older kids with it recently. They gave her a steroid treatment for the inflammation in her throat and said if it was going to work, it would in several hours. It didn’t. We sent June to school for the afternoon with a new coil-spring notebook for writing down what she wanted to say. She came home seeming tired and not particularly enthusiastic about going to her violin lesson, but I said I thought she should because her teacher drives from Baltimore and she’d already be on her way. She agreed and I said if she was still feeling worn out on Tuesday she could stay home from school to rest. 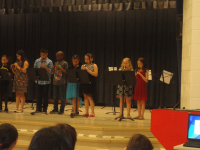 She practiced the recorder because the third-grade recorder concert was that evening and she wanted to go. I usually don’t let her participate in after school activities if she’s stayed home from school, but the concert was going to be quite short and it was a one time thing, so I agreed she could go to that but not to her Girl Scout meeting, which partly conflicted with the concert anyway. We did need to swing by it, though, to pick up a Mother’s Day gift she’d made for us the previous week. 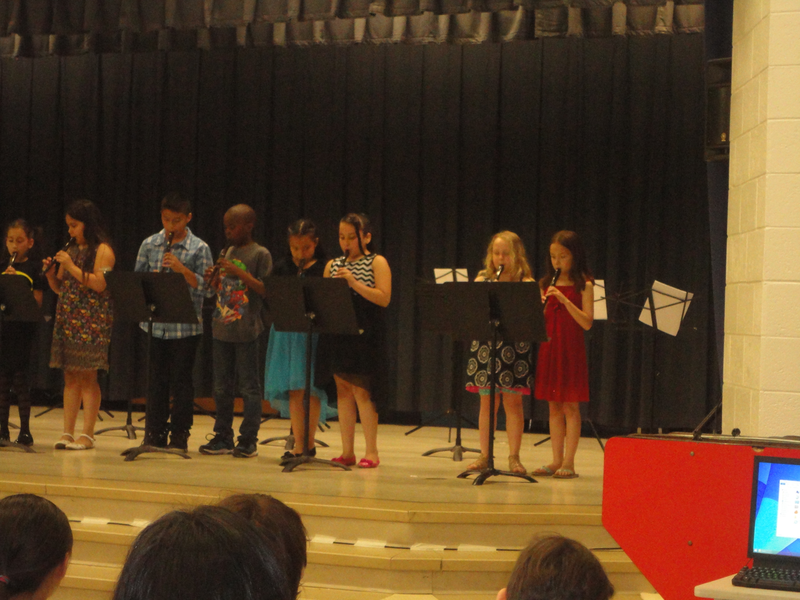 The recorder concert featured all the third grade classes playing a song or two each. It sounded about like you’d expect a third-grade recorder concert to sound. There were some familiar songs, like “Hot Cross Buns,” but then something called “Hot Cross Fun,” which started like “Hot Cross Buns,” and then went in a different direction. Megan’s class played something called, “Recorder Rap,” and June’s class did “It’s Raining” and “Old McDonald.” June shared a music stand with her friend Marisa. Megan’s mom Kerry commented she looked “very comfortable on stage.” I assured her she was indeed. After the concert was over, June started coughing harder than she had been. (I watched the video Kerry took of the concert later to count how many times she coughed in the footage. It was only twice while her group was on stage, once right before a song and once right after.) We wondered if playing had further irritated her throat, but she’d practiced that afternoon longer than she had played on stage with no ill effect. It was puzzling. Beth saw June’s morning and afternoon teachers standing near each other so she went to let them know why she’d be out of school and that we thought she’d be back Wednesday. We were wrong about that. Beth dropped Noah and me off at home so he could do a worksheet about the fall of Richmond and the siege of Petersburg (he’s studying the Civil War) and she and June went to her Girl Scout meeting to get the present. When they got home we all sat down to eat Noah’s leftover birthday cake. But June couldn’t eat. Her coughing had gotten much worse. We tried having her swallow a spoonful of honey, put her head in the freezer, and stand in the bathroom with a hot shower running but nothing helped. By this time she was starting to have trouble breathing, so Beth took her to the Emergency Room. They got seen right away, which Beth said was good and bad because it made her afraid it really was an emergency. They gave June a nebulizer to use and a second steroid treatment and a dose of narcotic cough syrup to help her sleep. It was after eleven when they got home and June was exhausted. She slept in our bed with Beth that night so Beth would know if there was a problem, but there wasn’t any. June fell asleep easily and slept until morning. Despite being up almost three hours past her bedtime, she was up at her usual time, and she was still coughing almost continuously. Every time we timed her over the next few days she was coughing every five to ten seconds. This leaves her enough time to breathe, but we thought it would be hard for her to concentrate in class and for others to concentrate around her, so she stayed home Wednesday and again on Thursday and today. She’s a little tired—and very bored—and her throat is understandably sore, but she is not otherwise ill. I read to her every day and did Mad Libs with her (doing all the reading aloud parts myself) and she came on an errand with me to fetch milk at the Co-op and helped me cook dinner twice instead of her usual once a week and also helped me bring laundry in from the clothesline twice. This afternoon I took her to creek to go wading. Mostly, though, she had to entertain herself, because I was trying to work. Beth bought her a book to read, and an invisible ink activity book, and swimming mermaid doll, who came with us to the creek. June practiced cartwheels and somersaults on the lawn, and unbraided and re-braided her Native American doll’s hair. She wrote and illustrated a little booklet called Poems of Nature. They are mostly rhyming couplets with a rather melancholy tone, e.g. “The raven hides his head in shame/crying to the world in pain” or “Sitting in the shade all day/Watching others go out and play.” I think she is getting tired of staying home from school. We’re currently waiting for a referral to an ENT and are all anxiously awaiting hearing her talk in a normal voice and go a whole minute without coughing. This entry was posted in Medical Issues, School by Steph. Bookmark the permalink.